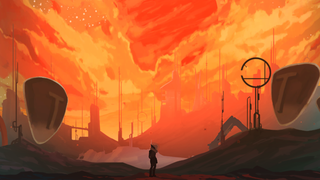 Crowdfund a game about writing fiction, Sci-fi anthologies and more! There's a bit of a Doctor Who bent to this week's look at all things crowdfunding, as we take a look at two projects inspired by the sci-fi series - but that's not all. There's an RPG about fighting your friends, a cool anthology of sci-fi and fantasy stories, and a game that's shaped by the story you write for it. Also, because the game is, itself, about a game, it allows the GM to intervene directly in the role of the director – the shadowy figure who oversees the game. Through this, they can keep the action moving and constantly drive the characters towards interesting scenarios and away from boring discussions of how best to arrange people's inventories. A $10 pledge nets you a digital copy of the games rules, maps and character sheets, whilst $25 gets you a printed copy. In a world not our own, Ambassador Durian (Paul McGann) of the technologically advanced country of Sezuan arrives in the sleepy kingdom of Tanto. Charming and handsome, he jovially offers the King a pact of friendship, then explains that if the King declines, his population will be annihilated. a £10 (roughly $16) pledge gives you a digital ticket to access the first of the four planned episodes of the movie, as well as your name in the credits. This project will fund a science fiction and fantasy anthology titled TEMPORALLY OUT OF ORDER, containing approximately 14 all-original (no reprint) short stories from established SF&F authors in the field—including David B. Coe, Laura Anne Gilman, Faith Hunter, Stephen Leigh, Gini Koch, Seanan McGuire, and Laura Resnick, plus others. The book will be edited by Joshua Palmatier & Patricia Bray, both editors of the DAW Books anthologies "After Hours: Tales from the Ur-bar" and "The Modern Fae's Guide to Surviving Humanity," and the Zombies Need Brains LLC anthology "Clockwork Universe: Steampunk vs. Aliens." You know the drill: $15 gets you a digital copy of the anthology, whilst $20 is enough for a physical edition. This Christmas, we want to make our best episode yet! It will be a musical adventure starring the Twelfth Doctor and Clara - something a little darker than our past Christmas episodes. We plan to create an atmospheric setting for a mysterious story to unfold in. The puppets won't speak or sing, so the music will be their voice. We plan to release the episode about two weeks before Christmas. A pledge doesn't actually give you access to the episode, which will be released on youtube anyway, but offers a variety of rewards like props from previous shorts, a chance to meet the creators at NYCC, or the opportunity to go and see the puppets and filming in person. $10 gets you a Steam key for the game when it comes out in early 2015.